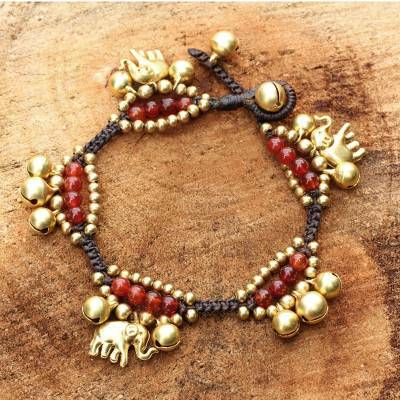 Ringing bells and smiling elephants appear in the melodious design of this bracelet. Bright carnelian gems, which represent July´s birthstones, alternate with brass bells and beads in a brown bracelet designed and crafted by Thailand's Tiraphan Hasub. 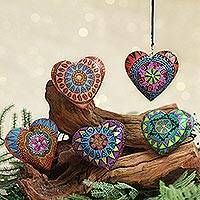 According to Buddhist customs, ringing bells bring good luck. Fun and charming bracelets for both kids and adults! Detailed, meticulous knotting and beading. A little bit of twinkling music for your wrist. Can't wait to wear this piece! "GIFTED TO SOMEONE WHO LOVES ELEPHANT PIECES"
THIS BRACELET WAS WELL MADE. I DIDN'T REALIZE WHEN I GOT IT THAT THE BELLS TINKLED FOR YOU. I WENT ON ABOUT IT SO MUCH THAT SHE THOUGHT SHE SHOULD GIVE IT BACK TO ME. SHE LOVED THE COLOR OF THE STONES AND THE SHAPE OF THE ELEPHANTS. SHE WEARS IT OFTEN AND LOVED THE PACKAGING TOO. 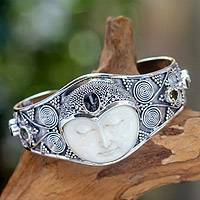 I bought this bracelet for my daughter who collects elephants. It is for her birthday in December and I know she will just love it. Can't wait for her to see it.